Whisper Ultra Clean Sanitary Pads Extra Large Plus Wings ensure that you wake up happy. These pads are all about loving life and loving yourself as much as you do others. The Whisper sanitary napkins continue to make you feel unstoppable and feeling great at any age. They ensure that you do not need to feel any less confident during "that time of the month". 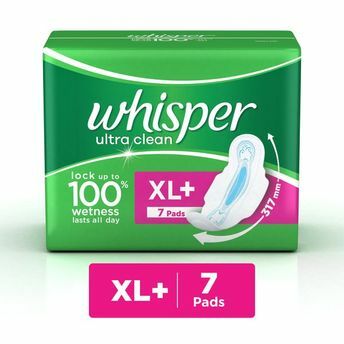 This revolutionary Whisper Ultra Clean XL Plus Wings sanitary pad provides 5 times better protection vs ordinary pads that lasts all day long.Designed especially for heavy periods, these pads provide five times better protection* and are 40% longer** for extra coverage. Whisper Ultra Clean has you covered, so you can get on with the things you love without having to worry about your protection.